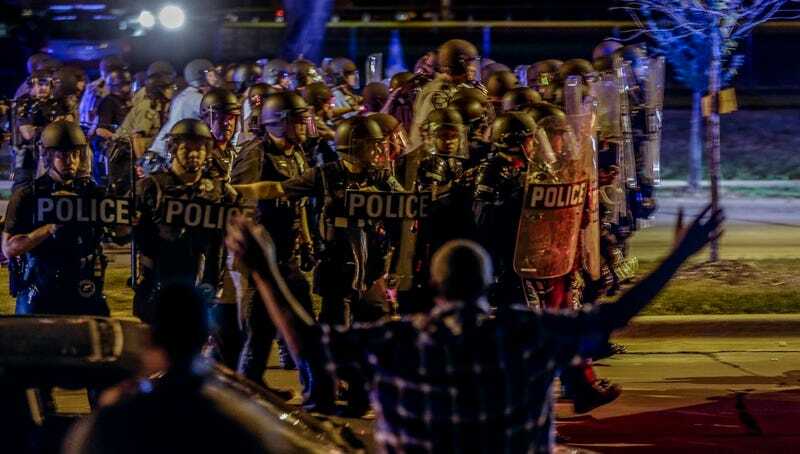 Milwaukee is currently struggling with unrest following the fatal shooting of an armed black man by a Milwaukee police officer on Saturday night. There have been protests every night since, some of which have turned violent. Amidst all the unrest, internet streams have been one of the few unfiltered sources of news. But some activists in Milwaukee have alleged that the biggest local internet provider, Time Warner Cable, now owned by Charter Communications, has been cutting off access to some neighborhoods by order of the police. We reached out to both Charter and the Milwaukee Police about these allegations, which mirror verified internet outages that have happened in during demonstrations in Egypt in 2011, Venezuela in 2014, and Bangladesh in 2015. But both Charter and the Milwaukee PD deny that they’re messing with anyone’s internet. “Those allegations are completely false. We don’t have that ability and we don’t do that,” a Milwaukee police spokesperson told me over the phone. He noted that the Police chief had been asked the same question about internet outages late last night at a local press conference. When I pressed the question of whether they’d have the ability to do that, noting that technically it wouldn’t be hard to turn off the internet for a wide swath of customers, the spokesperson conceded that maybe it was technically possible but said that they simply wouldn’t do that. Charter also said that they wouldn’t and haven’t turned off the internet for anyone in Milwaukee this week.